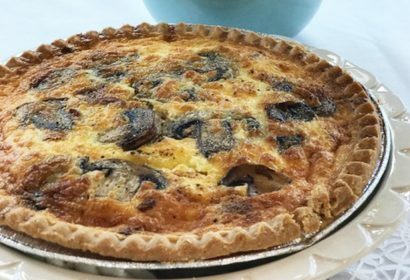 BRIE, MUSHROOM AND BACON QUICHE – The Maine Pie Co.
2. Prebake The Maine Pie Co. gluten-free pie crust according to package directions. 3. Cut rind off brie, and cube both brie and Swiss cheeses. 4. Layer cheese, bacon, and mushrooms on bottom of pie crust. 5. Mix eggs, heavy cream, yogurt, Worcestershire sauce, salt, and pepper, and pour on top of cheese, bacon, and mushroom mixture. 6. Bake for 45 to 50 minutes or until center is set. 7. Cool 10 minutes before serving.